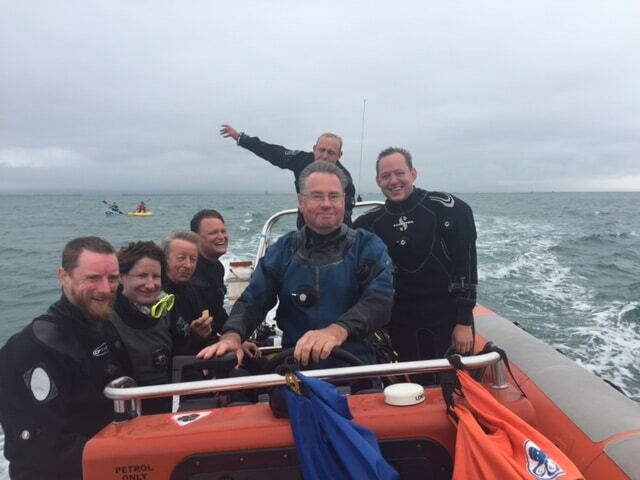 Dive count from RIB 2016: 184. Mad diver award (for most dives) winner: 27 dives. Trips:9. Number of different divers: 20. So we grew on every count! We kicked off the season with a well-attended Christmas trip to Stoney where groups of people had to re-enact their favourite scenes from their favourite films. I have seen some really shocking things underwater but that definitely took the biscuit. Thank you to all of you who attended, it was really nice to meet with Romain’s lovely family. It was also the occasion to welcome Lukasz and Marcos to their first ever UK dive. 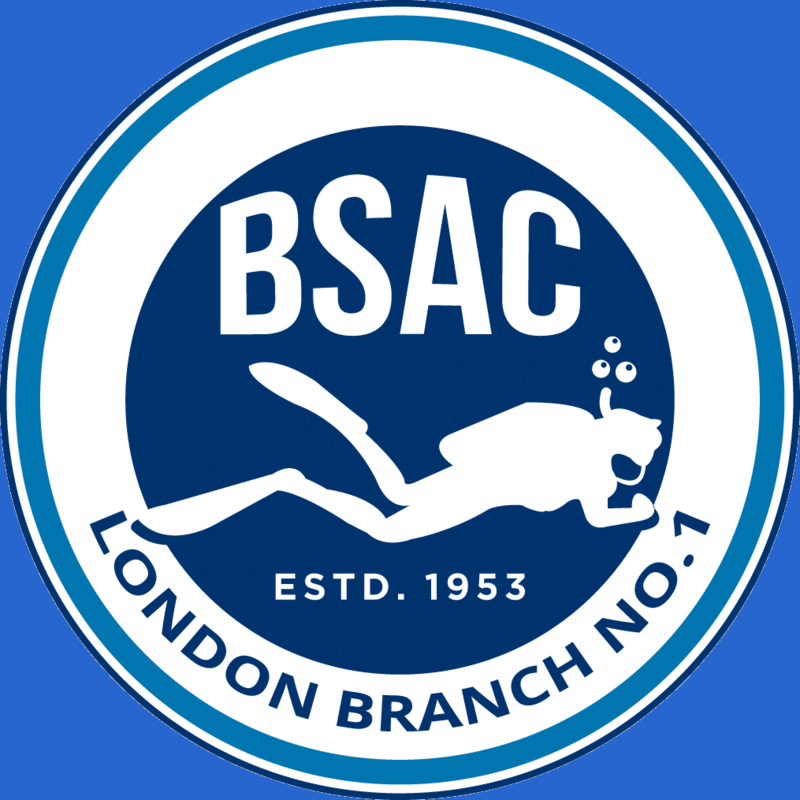 My first UK dive was also a Christmas dive although it was in Wraysbury proves that there has been an improvement in the club over the years! Although the water was a bit chilly we did manage a good twenty minutes and we even made it to the plane. To do with us all being a bit rusty. I also found really entertaining when Andrew was left on is own on the boat and had to lift up un unconscious James with no help. Our next trip saw a small group heading to West bay. It was the occasion to meet Peter who joined us on a dive trip for the first time. The vis was quite Challenging that weekend but we did dive on some very good wreck like the Saint Dunstan and the Bagytano. It was good to be back in Westbay too which we had avoided for a few years due to the lack of air compressor. It is very handy that the Harbour Master is now in charge of it and that we don’t have to go to that horrible tackle shop like we used to. Andrew organised our next trip over the first May bank holiday weekend and had the very good idea to extend it one extra day. The trip was well subscribed and we had a good mix of steel and rock diving with some stunning vis on the Glen Hallen and the Scilla. We also managed to visit twice hands deep which is definitively one of my favourite UK dive site. We did avoid the lighthouse this time as some of us were still traumatised by what had happened there last time. After this we went to Weymouth. Barny organised this trip. We were in full plankton bloom and dived through some really challenging condition but still we had a very enjoyable weekend. We continued our tour of Dorset with a trip to Swanage. Nathan organised that one, the weekend coincided with Swanage seafood festival which was quite handy at lunch time. The Weather conditions were not ideal over that weekend but Nathan was never fazed out even when on one occasion because of sea conditions, his plan A turned into plan B which turned into plan C. Well worth always being prepared! We returned to Westbay at the end of June. 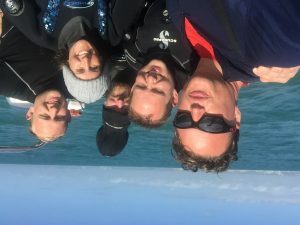 Chris organised this trip and we had some very good reef diving over West and East tenant which I am never bored on Thank you Chris for organising this trip! We returned to Weymouth in early August. Barny once again organised this trip. I missed this trip unfortunately, however I have heard of an attempt led by our most accomplished and respected divers (Nigel and Keith) to tow Roberta all kited up water-ski style from Persy to the shot line! This sort of things always happens when the D.O. is away. We returned to Swanage again organised by Nathan – on this trip we saw Declan and Marcos for the first time. 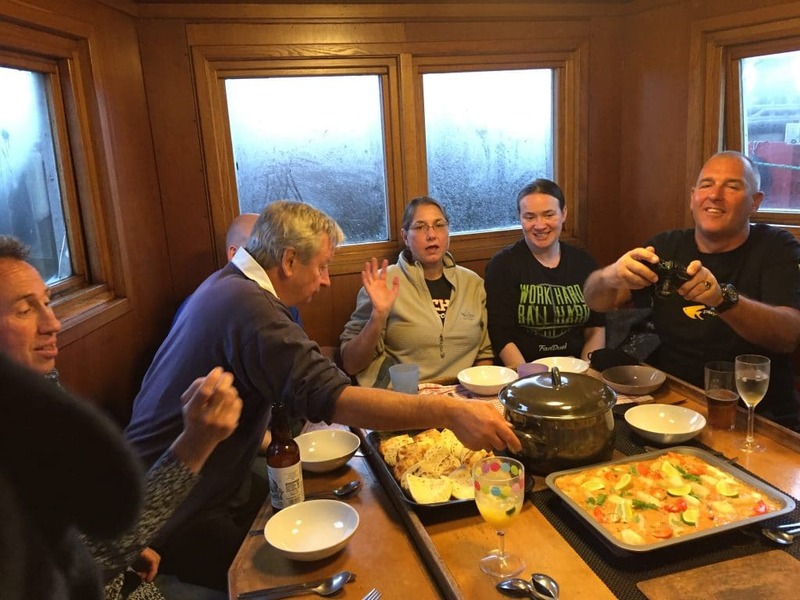 It is always very positive and refreshing for us oldies to have new members on a trip and especially when it is their first ever dive trip! Marcos not only finished his last Open water dives and is now focusing on the exam paper but he also entertained us no end. I remember receiving an SMS from Nathan describing Marcos status as “last seen bare feet and wandering in his pants through town looking for a sandwich”!…Nathan arranged to dive places which we don’t dive much, like the wreck of the Venezuela which according to those who dived it was really good (it still gives Barny a nightmare with the number of lobster sightings) and this is a good reminder to us all that there are so many dive sites in the channel that we should try to take some risk and not only dive places that we have dived already many times. We finished the weekend in beauty with a sea horse search in Studland Bay. 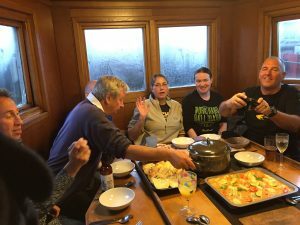 After that Emma had organised a live-aboard trip aboard the Halton to the Shetland. The trip was full and saw a mix of club members as well as of friends of the club. The trip was very good; stunning good vis, good food and good company. Although according to one of the crew members we were quite high up on the list of the most annoying dive party. I think they got a bit shocked when Andrea and Emma loaded two crates of booze. For the last trip of the year, we went back to WestBay. This was organised by Verity. 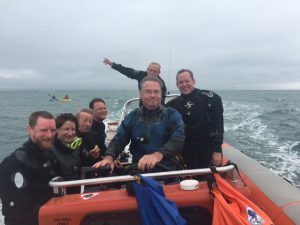 This was Verity first trip as Dive Marshall and it was really unfortunate that we were blown out on the first day however people who attended made the most of it, either going for a hike or windsurfing. The Sunday was much better although very very choppy still and if it was not for Barny’s determination, I think we would have given up. But we went to the Baygitano and to my surprise, I had never seen such good visibility on this wreck. We actually return to the Baygitano in the afternoon, firstly because we forgot to pick up scallops on the first dive but also because it was too difficult to drive the boat to the Heroine which was our intended site. In general I think we had a very good year. I think logistically it was much easier. Having the boat stored in Dorchester makes it easier for us to get the boat on sites. It makes it as well less tedious for boat towers especially on the return journey home. It does have some disadvantages though that we need to keep in mind: for example the trailer and the boat do not get the amount of TLC that they used to when they were on Nigels drive. And it shows a lot. I hope Nigel won’t have a fit when we winterise perseverance this year. 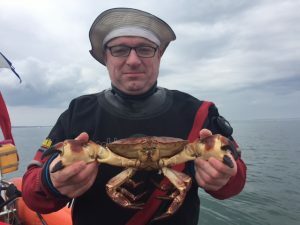 It also means that realistically we are limiting ourselves to which area we can reach and this is one of the reason we dived so many time in Dorset this year. Having said that there are still many, many dive sites that we have yet to visit that area and we should take advantage of the variety of wrecks and reefs that we are lucky to have access to. Chris, Andrew, Barny (at least three trips), Nathan (two trips), Verity and Emma. I would also like to say a big thank you to a very reliable and dedicated team of instructors led by Leigh for the time that you give to the club every Tuesday, Aidan, Alex Marshall, Jon and of course Leigh.